To give blood for testing, you will sit in a chair or lie down and place your arm in a slightly raised armrest. The blood test procedure is a simple and quick process in which a fine needle attached to a vial is inserted into a vein, usually in your arm. It is a good idea to inspect the inside of each of your elbows prior to the test to determine which arm has the strongest, (largest) vein. You may wish to provide this information to the clinician responsible for the test; you may also choose to simply place the arm you have chosen into the armrest. The clinician will tie or clasp a strap, called a tourniquet, around the top portion of your arm to stop blood flow for a moment. Restricting blood flow allows your vein to fill up with blood, making it easier to locate. The area inside your elbow will be cleaned and disinfected to prevent infection. Many people find that it is helpful to refrain from looking at the needle before it is inserted into the vein. Usually, the anticipation of the procedure creates more of a sensation than the procedure itself. The clinician will let you know before the needle is inserted. The needle will cause a pinching sensation that should last for only a moment. Some people experience no pain, while others feel mild pain. Once the needle is inserted, it will withdraw the blood and collect it into one or more airtight vials for testing. These vials are designed to prevent contamination while locking blood in. After the clinician has collected a sufficient sample to conduct the tests, he or she will quickly remove the needle, apply pressure, and cover the entry point with a bandage. Applying gentle pressure to the site for 3-5 minutes can help to prevent bruising. The process usually only takes a few minutes. You should feel ready to resume normal activities after giving blood. Sometimes people feel dizzy or light-headed during or after the procedure; if you begin to feel this way, be sure to let the clinician know. He or she will help you find a comfortable position for the duration of the procedure. Dizziness and/or light-headedness are more likely to occur when fasting (not eating or drinking) is required before the test. After collection, your blood samples are sent off to a lab for diagnostic testing and analysis. Your doctor will receive the results and contact you. 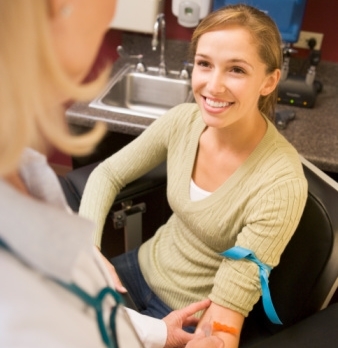 Always be sure to ask your doctor if you will need to fast (abstain from drinking or eating) before a blood test. Fasting may be necessary if other tests are to be performed simultaneously.